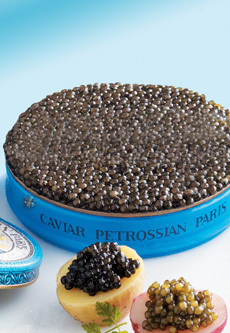 For years, Petrossian has been the king of Russian caviar. Photo courtesy Petrossian.com. This is Page 8 of a ten-page glossary. If you’d like to suggest additional words for inclusion, or think we should consider other definitions than those we have provided, use the Contact Us link on this page. You may also enjoy one of our 60+ other food glossaries. BEYOND CAVIAR, THERE ARE 100 MORE FOOD GLOSSARIES. A term sometimes used for salmon caviar, although other fish roes such as masago and tobiko are also red in color. This is a trademarked name and more than a little misleading—it implies that the caviar comes from beluga sturgeon raised in a river. However, it is not from the Huso huso, or beluga sturgeon. 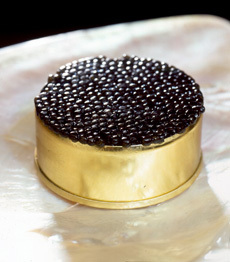 River Beluga caviar comes from the Huso dauricus or kaluga sturgeon. Sellers claim that River Beluga Caviar has a large dark amber pearl with a taste as smooth and buttery just as Caspian Beluga Caviar (at $200 an ounce compared to $230 for Beluga, we hope so!). See kaluga sturgeon for more information. The eggs of a fish, also called berries, pearls, and grains. In addition to sturgeon roe, roe from several different species of fish is enjoyed by consumers: keta roe from the keta salmon; masago from the smelt, tobiko from the Icelandic flying fish, avruga from the Spanish herring, plus American caviars (roes) from the bowfin, lumpfish, paddlefish, trout and whitefish. In the caviar trade, once the roe has been salted it becomes caviar. Russian caviar is caviar that is harvested in Russia, from any species of sturgeon. “Russian caviar” used to recall the great Caspian sturgeons: Beluga, Osetra and Sevruga. However, each of these great fish is on the World Wildlife Foundation’s Endangered Species List. Thus, while countries that border on the Caspian are allowed to fish for them and use them for domestic (non-export) purposes, there may soon be no fish left to capture (see Caspian Sea). Today, some non-Caspian sturgeon, specifically the Russian Sturgeon (Acipenser gueldenstaedtii, the same species as the Caspian Osetra living elsewhere) and the Siberian Sturgeon (Acipenser baerii baerii, a cousin of the Osetra), are still caught wild in rivers of the continent. Siberian Osetra Malossol. Available at CaviarRusse.com. These sturgeon are also farmed, everywhere from Bulgaria, Italy and Israel to France, Germany and Uruguay. While the Russians developed the caviar industry that we know today, perfecting their processing methods through generations, the Russian caviar industry itself is currently in a huge decline due to drastic over-fishing and pollution of sturgeon in the Caspian Sea (abetted by internal political turmoil).